It’s late. You’ve just returned home from a long night of networking, and you are all set for a warm, relaxing shower. Towel in hand, you open the door to your bathroom and – PHEEE-OOW! A wall of stink hits you full force in the nose. What is that horrible smell? Where’s it coming from? And most importantly, how do I get it out of here? The very first thing you need to do is figure out where the smell is coming from, and what is causing it. Put on your sleuthing hat and, as the toucan would say, follow your nose. Does the odor smell stale, with a mild sting to it? Sharp, musty odors are the result of mildew and mold, which are abundant in humid environments. The bathroom is a veritable paradise for mold because there is always a water source, and many bathrooms are not sufficiently ventilated to allow all moisture to evaporate. Water gets trapped in the grooves between tiles, or it can puddle up under appliances or near the shower. Check those places for water buildup, and the tell-tale green and black colors of bath mold. In its early stages the mold can appear in a slightly-pink hue. Is the odor powerful and rotted, like bad eggs? This could be a sign of light sulfur fumes, a common result of a septic issue related to the plumbing in your toilet. Does your toilet flush properly? Is the wax ring at its base intact? It could also be an issue involving backup of hair, toothpaste, soap, shaving cream, and more getting caught in sink and shower drains and creating a heavy sludge that traps odors close to the mouth of your drain. Don’t be afraid, get close to the drain and take a big waft. Did you fall backwards onto the floor? Yup, it’s the drain. So you’ve figured out the problem, now it’s time to devise a solution! A good place to start is with ventilation. Open all the windows and let the fresh air in. Turn on ceiling fans and exhaust fans. This will mitigate some of the stink while you work. Avoid using any scented products such as air fresheners or candles because this will just make the problem worse. If an odor is coming from backup in your pipes, pour a cup of baking soda in the drain, followed by a cup of vinegar. This will create an oxidizing reaction that will break up the sludge and force it down the drain. Rinse with a kettle full of hot tap water. This will get rid of the cause, but the stench will still linger. To get the tough smells out, pour ODOREZE™ Natural Drain Odor Eliminator down the drain, let it work for 15 minutes, and then pour hot water. This natural deodorizer will eliminate the odor, grease, and grime without using any harmful chemicals. Thereafter, you can use ODOREZE™ regularly to ensure the smell doesn’t come back. If the problem is mold and mildew in your bathroom, thoroughly wash your tiles (on the floors and the walls) and make sure you get in the grout, that’s where most of the mildew and mold builds up. Use a powerful deodorizing cleaner like ODOREZE™ Natural Home Odor Eliminator for the best results. You can add a little bleach to it as this will inhibit future growth. Scrub with a heavy sponge and for really ingrained mold, use a magic eraser or steel wool. If the odor comes from your toilet, check the wax ring that seals the toilet base to the septic pipe. If this ring is corroded or has come unsealed, it will allow sewer odors to seep out of the pipe and into your bathroom. Replace the ring, reset the toilet. Voila! The odor may also be from the toilet basin. In this case, it will require a thorough cleaning. Once again, you can use ODOREZE™ Natural Home Odor Eliminator to clean around the basin, and then pour some ODOREZE™ Natural Drain Odor Eliminator down the sink to neutralize the smells and keep it fresh. If there is a urine smell in your bathroom, know that a scented air freshener won’t solve the problem, just temporarily hide it or make it worse. Simply add ODOREZE™ Natural Floor Odor Eliminator to your usual cleaning solution to get the smell out while cleaning so you don’t have to do any extra work. If the smell is really strong, you can also sprinkle SMELLEZE™ Urine Smell Deodorizer Granules, leave overnight and then vacuum or sweep up. This will give it time to pull up and absorb all the urine odors that are stuck deep down in the floor. It’s also great for houses with pets, as well, as it’s designed to eliminate other pet odors in addition to urine odors. Turns out, pet smell eliminators are great for bathrooms too! Now that the smell is taken care of, it’s time to take some precautionary measure to keep the smells from coming back for as long as possible. 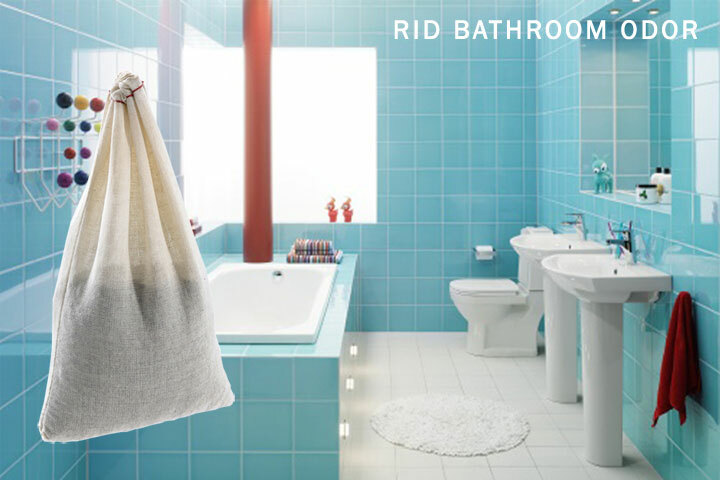 If you place SMELLEZE™ Reusable Bathroom Smell Removal Pouches in the nooks and crannies of your bathroom, they will continuously soak up unpleasant toilet odors as they surface. You can also absorb moisture (more efficiently, and with less black coal detritus than charcoal!) with a desiccant like the MOISTURESORB™ Reusable Moisture Absorbent Pouch. This will help prevent mold and mildew. If you want to conceal the pouch, placing it it in a small bowl with decorative sea shells makes for a lovely ornament, but it will also keep your air smelling crisp and clean. Another useful tip is to use SANITRO™ Disposable Commode Urine Absorbent Mats around the toilet. This commercial grade mat, which will last 6-8 weeks, contains urine drips, absorbs them, and eliminates the smell. This is especially helpful for children along with elderly folk and also reduces cleaning. Now you’re fully armed with the know-how to tackle any bathroom odor! Never again will your socks be knocked off by a wall of unpleasant smells. From now on, you’ll be greeted with nothing but cleanliness and pleasant aromas! It’s awkward to deal with a smelly bathroom. I can’t even think myself such a situation. But sometimes I also have to face this condition and most of the time I use a plunger to unclog my toilet with vinegar and baking soda for cleaning the bathroom sink. But prevent is always better than cure. So many thanks for sharing some great tips for prevention.